to have a look and get the following message. What have I done. I thought I was being so careful. SOLVED: Just kept "playing" with modules etc and allcame good. 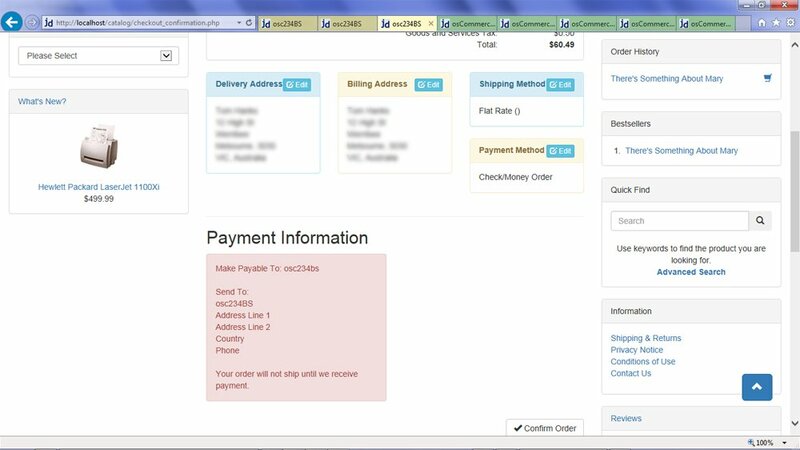 This line also appears in a couple of the paypal payment ext modules. Probably easier to fill the defines than check for null values in $quote['methods']['title'] in all these files. As far as I can tell in previous versions of osCommerce these language files definitions for define('MODULE_SHIPPING_******_TEXT_WAY', ''); were always populated. This is not a BS topic. This is in normal osC as well.. Couple of minor errors in the footer suffix content modules. Thanks for spotting. Fixed and committed. This took some investigation and seems to be caused by errant ; in SQL file. THis commit fixes it, if you could find time to confirm by re-installing from scratch that would be excellent, thanks. I did a test install of the latest 234bs and the issue still appeared. The only thing I could see different in the bs version of the oscommerce.sql install file to other osc versions is that there are no comments or blank lines after the last sql statement. So I tried another clean install (new database table etc.) without the comments at the end of oscommerce.sql and this time it worked. The "Create Account Link" sort order was populated correctly. i just did 2 test runs. problem seems to be solved as @@auzStar mentioned above. I also did another test and left 1 blank line at 1631 like @@Tsimi did, whereas in my previous successful test I had no blank lines (nothing after last sql statement). Success again. So that's 2 successful with a blank line at 1631 and nothing else after. Conclude that it's possibly an issue with the comments at the end. I left one line because in the regular osC 2.3.4 oscommerce.sql file there is an empty line after the last statement, so i thought why not try to do the same thing. Still i would have never guessed that THAT is the reason for not inserting the last statement correctly and therefore missing the text. Module box reviews defaults to "Product Page" on install. Also should bm_information.php module (and language) files exist since it was removed here? Then it would be wise to update the sql file in the github. Maybe you can't add a pull request but i think burt should be able to change/edit the file. I saw that you mentioned it but it wasn't changed. do i download the latest version from github page? or the first page of this thread? Should I just follow each commit and make the changes as you/the community makes improvements/changes? In particular I was looking for the equalhights changes on index for new products on Nov 19th. 1. create a github account and fork my master. Option 1 sounds like a bit of a rainy day project - but something I would like to do. So, I will grab the equalheight stuff for now - and maybe over the holidays when we are less busy get going on the github "thing"
Once you got that 10 minutes done, then 30 seconds (1 button press) each time you want to update. This shows the process takes less than 2 minutes. I am sorry there is no sound, I could not find my headset. Next video will show how to check that your new master is up-to-date with my master. Pre-step to this video: I changed the README document in my master so that the burtyblotto fork would pull it in. I could just as easily have changed index.php or any other files, or 20 files or 100 files, or added new files or whatever...had I not changed at least 1 file, I could not have shown the new Pull Request system that Github recently introduced. Hope this makes sense ? Again, no sound - sorry. It's easy to follow though. Important Note: Once you have a master fork, it's important that you NEVER manually change it (as you might then get a conflict between a file you have updated and a file that I have changed at my master). I suspect that might lead to more questions (from those who not only want to keep a master, but also want to try their hand at coding) - I'll try my best to answer those questions as they arise, but those questions really don't affect those who simply want to keep a clean master copy. Only ever change your Master by pulling in any commits from my Master. @@burt ok step one is done... yes 2 mins. I'm having trouble wrapping my brain around Step 2. How do I compare the changes I've already made to your fork? Do I need to start a new repository and upload my files? Or maybe I'm looking for step 3 and that is my confusion? Because my fork is up to date? I asked burt the same question few days ago. How can i keep my fork up to date with his new commits. What i found to be the easiest way for me is. ignore that and click on the edit button right side. Now you should see a "base fork" and a "head fork" dropdown. Now switch those two. Make your fork the base one and gary's one the head fork. We’re showing branches in this repository, but you can also compare across forks. click on the "compare across forks" link to setup the second dropdown. Now it should show you the different commits and you should see a big "create pull request" button, click on that. Now name it what ever you like and click on the "create pull request" button. This pull request can be automatically merged. with a "merge pull request" button on the right. again rename it if you want or just click "confirm merge"
Now you should see some sort of confirmation and a revert button on the right just in case you want to undo the merge/commit. the only thing confusing about this is now that you are one commit ahead of burts, because of the merging. ignore that and keep that memorized in your head.